THE BIG BALL STARS — featuring Robin McAuley (MSG, SURVIVOR), Chris Holmes (W.A.S.P. 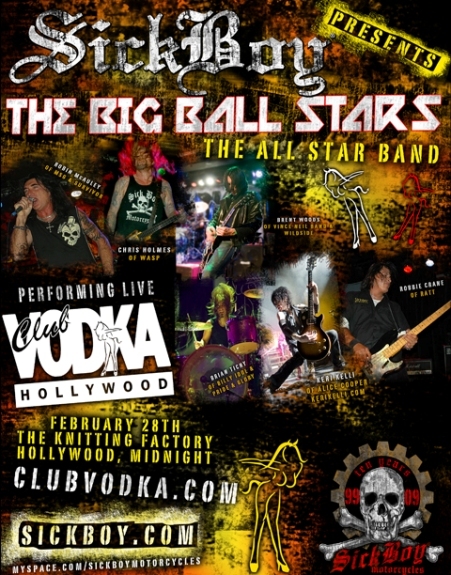 ), Brian Tichy (BILLY IDOL, OZZY OSBOURNE), Brent Woods (VINCE NEIL), Robbie Crane (RATT) and Keri Kelli (ALICE COOPER) — will perform tonight (Saturday, February 28) at The Knitting Factory in Hollywood, California. For more information, visit www.clubvodka.com.